Dr. Carley grew up in Wichita, Kansas and attended Kansas State University. He earned his undergraduate degree in animal science in 1983, followed by his Doctorate of Veterinary Medicine from KSU in 1987. While he has been in Tulsa since graduation, it wasn’t until April 1991 that he opened Hunters Glen Veterinary Hospital. 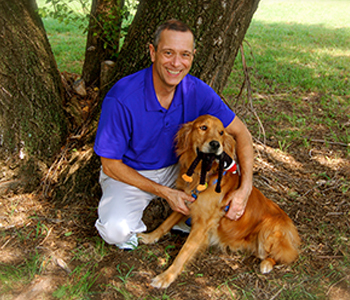 He has been certified in veterinary acupuncture for over 20 years and herbal medicine for over 10 years. He is an active member of the AVMA and the AHVMA. He has been married to his wonderful wife for over 30 years, and has three sons and a grandson. He has coached many Bixby youth teams in football, baseball, and basketball over the years. But Dr. Carley’s interests don’t stop at coaching sports. He is also a black belt in taekwon-do and bujinkan taijutsu. Not only is he a certified national instructor of taekwon-do, but he has also competed at both national and international levels.